Market-Share: Why are Maps drawn North to South? My Taiwanese friend gave me a question. And I returned her with a long answer. 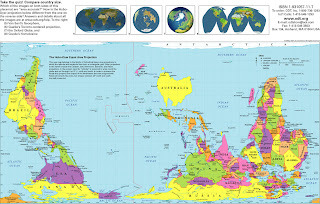 Question : Why are most maps drawn North to South and seldom South to North when from astronauts point of view, they usually see earth the opposite direction? 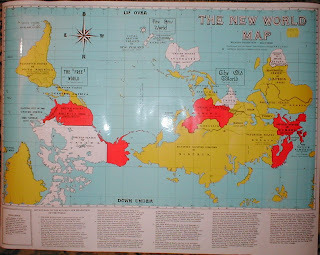 The reason why maps are drawn North to South is due to a tradition set forth by our forefathers. Although the Universe has no clear directions but humans need a navigation guide to set our compass right and put a reference to everything, hence the invention of bearings and directions. If today, bearings were invented with South on the top and North at the bottom, we would naturally find it acceptable. For example if aeroplanes were known as trains all along, we would never have doubted why was it named as trains in the first place. My other rationale is that although Chinese are likely the first people to draw a complete world map, yet it were the Europeans and Americans who began mass producing it. And they would naturally place the orientation of their own countries on the top. This is due to the psychological way of human habits in looking at things. We always look top down. Even China would not have used the South-to-North Map. China is known as the "middle kingdom", the center of the world. But if placed in a South-to-North map, they will no longer be positioned in the "middle". Hence traditionally, politically and historically, south-to-north maps will never be used and produced widely.